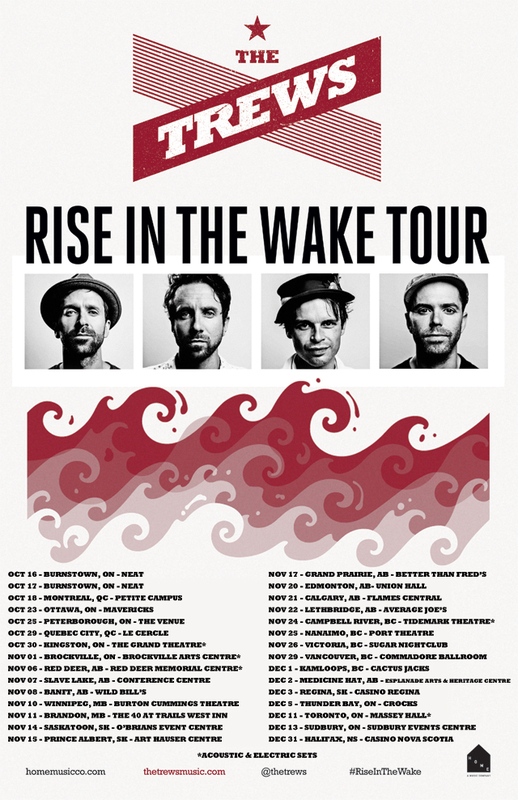 Ahead of their Fall 2014 Canadian Tour, Jean Frederic Vachon had the opportunity to chat with The Trews’ frontman Colin MacDonald about their new album, the tour and more. Jean Frederic Vachon (JFV): What’s been going on with The Trews lately? Colin MacDonald (CM): We put out a new record in April, and we’ve been touring behind it pretty much since then. We’ve done a couple of American tours and a bunch of Canadian summer festival dates. We’re currently on like a two week break before we head over to the UK and do a week’s worth of shows over there [The Trews will open for the Supersuckers] and then we’re going to come back and start our fall Canadian tour. JFV: I wanted to talk about the album a little bit. You called the album The Trews, and often when bands release self-titled album they’ll say it was a return to form or a new beginning. Was that the case for you? CM: Ah, yes, well, maybe a little bit. It kind of started out on the fact that we couldn’t decide on a name for the album, everyone had a different idea for a name, so we couldn’t agree on one. But the way we made the album, we did it through a thing called PledgeMusic which is like a fan funded site. That helped us pay for the making of the record and we figured the album kind of started to represent The Trews and The Trews fans, and us coming together to make this album, and we thought it was a good thing and maybe we should just call the album The Trews and let that be the album. JFV: How did you like the experience of working with PledgeMusic? CM: I really liked it, it was a lot of fun, it was a great way to get the fans involved. We met with Benji Rogers, the founder of Pledgemusic, I think in March 2013, and he kind of sold it to us as the ultimate fan club experience and we had a lot of fun with it! You could pledge on everything from singing on the record to playing street hockey with the band. In some cases we had fan singing on five or six tracks on the record which was a lot of fun. JFV: The music business has changed a lot in the last 15 years. Do you think that’s the future? CM: I think that’s one of the ways. I’m not sure it’s the only way, but it’s definitely an interesting way of going about the making of a record. And you know, it kind of goes back to the idea of patrons of the arts: people that are financing the products that the artists are working on. I mean it’s definitely a unique and kind of cool way of approaching the making of a new record. JFV: Do you think you’ll use it for the next one? CM: Not sure yet. I mean, we still haven’t really thought about that yet, but it’s definitely a possibility. JFV: What’s your songwriting process like, as a band? CM: This time around, I mean, it varies from record to record. On our fourth album (this is our fifth), we wrote and recorded at the same time. We went to a studio outside of Kingston, Ontario, and we wrote songs and recorded them as they were coming out. This time around, we wrote in a concentrated period of time between January and May 2013 at our jam space in Toronto, and once we decided on Gavin Brown as our producer, we went into the studio in the fall and recorded over a period of 2 or 3 weeks. So, to answer your question, our process is to go to our jam space everyday for 4 or 5 hours, and just jam on riffs and melodic ideas and lyric ideas and try to come up with tunes. JFV: Last time you were in Montreal, you played an all request set. That must be hard? Do you sometimes get requests for stuff you haven’t played in a while and can’t really remember? CM: Yeah, it definitely led to some interesting moments for sure, but it was kind of fun for us because we’ve been playing together for so long, and we know most of the material pretty well. But in some cases it was a song we didn’t know that well and we kind of fumbled through, trying to make it an interesting moment on stage that would be fun anyway. You know, sometimes people will remember the time you screwed up that song more than they might remember you playing it well! The whole idea behind the all request set was to have the fans feel like they were involved in the show, so it worked out. JFV: Are you going to do that again this time? CM: I don’t think so. The acoustic tour was kind of the scene for that, I don’t think we’re going to do it this time. JFV: How do you pick your setlists? CM: My brother, John-Angus, the guitar player, he pretty much writes it every night, so we just follow whatever he’s feeling. JFV: What’s your favourite track to play live? CM: On the new record, probably What’s Fair is Fair. I really like playing the song Hope and Ruin, but you know, it changes from night to night. Sometimes certain songs will find a life of their own depending on the mood, the crowd and the vibe of the band. JFV: I got to say, you’re one of the best live bands I’ve ever seen; why do you think the stage brings out the best in your band? CM: Aw, thanks man. That’s a good question. It’s certainly something we’ve heard over the years, especially pertaining to our inability to capture our live sound on record. (laughs) But we get a good kick out of being up there, we have a lot of energy, it just happens when we’re on stage: it rocks! It’s always been like that, I can’t describe it beyond that except to say we get a kick from being on stage and playing in front of people, and it brings our band to a whole new level. JFV: You recently produced an EP for a band called Little Foot Long Foot. What kind of challenge does producing represent for you? CM: So far, I love it. It IS challenging in the sense that you’re the guy calling all the shots. You’re the guy who’s going to get blamed if things don’t go well! (laughs) But I loved it right away, especially when I’m in there and working with a talented band like them, it was just a lot of fun. It was great to go through their songs and pull them apart and put them back together again. Just apply the stuff that I’ve learned over 10 years of making records, you know? I’ve worked with a lot of really great producers, some of the best in the world, and I just kind of apply what I’ve picked up from them and bring it to another band. And oftentimes it’s enlightening for them; I’ll show them some trick that I learned that I didn’t really think about too much and it kind of blows their minds and it leads to the chorus or the song being better, stuff like that. I took to it pretty quickly and I like it a lot. JFV: When is the EP coming out? CM: Their EP comes out in November. It’s a really rocking, 3-piece power trio with a great female singer. JFV: Speaking of EP, there is a question I have to ask. You have an EP out called Thank You and I’m Sorry, and there is a song called …and We Are The Trews where you name drop a lot of Canadian artists. I gotta ask and it’s not because I want to defend her but why are you ending the Quebec section with “mais pas Céline” Did I hear that right? CM: (laughs) Yeah, I’m glad you picked up on that. You’re the first person to ever, ever ask me that question. (laughs) It was our way of just being cheeky and tongue in cheek, and the whole idea was that we were only going to name check rock bands, like touring Canadian rock bands so we didn’t want to include Céline Dion, but no offense to Céline, it was just a little joke that you’re the first person to even pick up on that. Yeah, we’re busted. (laughs) But we name checked Jean Leloup and Les Respectables and Eric Lapointe. They rock! It was one of those things, you know, maybe in hindsight we’d go back and take that out but it was just a joke at the time between us and a guy named Gordie Johnson who we wrote the song with. JFV: Well that was pretty funny! I liked it. JFV: So what’s next for The Trews? You’ve got this tour; then what?